Down 2-0 in the series, the Hawks needed a win in the worst way against St. Louis on Monday. Here's how they earned their first victory in the 2014 postseason. 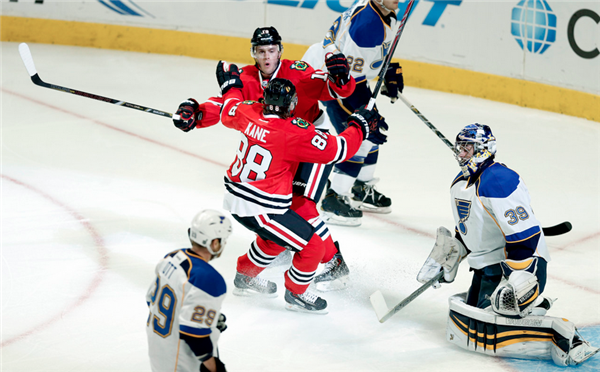 Could the Blackhawks-Blues series be any more tense? No, we're seriously asking. Between St. Louis captain David Backes getting his head pounded like a pinata and Brent Seabrook's suspension, these teams won't be best friends anytime soon. Jonathan Toews' early goal stood up Monday thanks to Corey Crawford's 34 saves in a 2-0 shutout at theUnited Center. Marcus Kruger tacked on an empty-netter, and the Hawks head into Wednesday's game at home trailing the series just two games to one. In the meantime, several players earned punishments of their own in Game 3 on Monday. Crime: Blues defenseman Roman Polak jacks Brandon Bollig in the ribs half a dozen times during a scrum in the corner. Not cool man. Punishment: Polak must ride a Divvy all the way back to St. Louis. In January. Crime: Jonathan Toews whips a shot through Ryan Miller’s legs to put the Hawks up 1-0. Punishment: Next time, he at least has to call the goaltender’s mother after humiliating him like that. Crime: Blues center Maxim Lapierre goes to the box after shoving Sheldon Brookbank into the corner boards. As soon as he’s out, Polak delivers a cross check. Punishment: A round each against Brandon Bollig with their hands tied behind their backs ought to knock some sense into them. Crime: Miller stops Ben Smith’s backhand attempt from in close. Ditto on Toews’ stuff attempt from point-blank range. Then a terrific stop on Hossa at the tail end of a Hawks power play. Punishment: Miller must volunteer at a homeless shelter for three months. You steal like that, he must learn how it feels to give back. Crime: Hawks forward Brandon Saad kicks the puck down the ice because he broke was broken and he had to leave it behind. Punishment: He gets an A for effort, but he’s sentenced to watch 50 hours of World Cup soccer this summer. See how the real pros do it. Crime: Corey Crawford with the shutout. Punishment: The Hawks goaltender must go to his room and think about what he’s done. So he can do that the next time.